Septoria leaf spot on tomato (Lycopersicon)Septoria leaf spot is caused by a fungus, Septoria lycopersici. It is one of the most destructive diseases of tomato foliage and is particularly severe in areas where wet, humid weather persists for extended periods. Septoria leaf spot usually appears on the lower leaves after the first fruit sets. Spots are circular, about 1/16 to 1/4 inch in diameter with dark brown margins and tan to gray centers with small black fruiting structures. Characteristically, there are many spots per leaf. This disease spreads upwards from oldest to youngest growth. If leaf lesions are numerous, the leaves turn slightly yellow, then brown, and then wither. Fruit infection is rare. The fungus overwinters on infected tomato debris or on weeds in the nightshade family, the same family to which tomatoes belong. The fungus can also survive on equipment such as plant stakes and cages. Long periods of high relative humidity, temperatures of 60–80 degrees F, and leaf wetness are ideal conditions for development and spread of the pathogen. Remove diseased leaves. If caught early, the lower infected leaves can be removed and burned or destroyed. However, removing leaves above where fruit has formed will weaken the plant and expose fruit to sunscald. At the end of the season, collect all foliage from infected plants and dispose of or bury. Do not compost diseased plants. Improve air circulation around the plants. If the plants can still be handled without breaking them, stake or cage the plants to raise them off the ground and promote faster drying of the foliage. Mulch around the base of the plants. Mulching will reduce splashing soil, which may contain fungal spores associated with debris. Apply mulch after the soil has warmed. Do not use overhead watering. Overhead watering facilitates infection and spreads the disease. Use a soaker hose at the base of the plant to keep the foliage dry. Water early in the day. Control weeds. 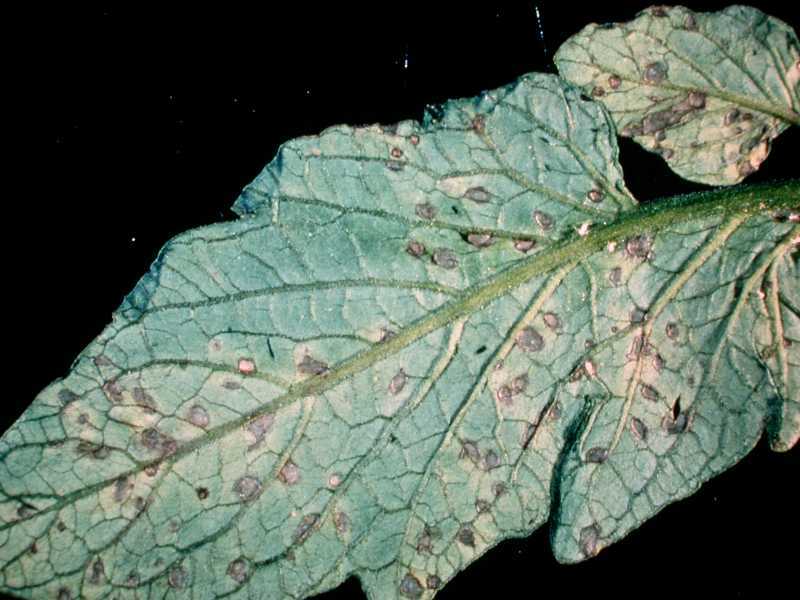 Nightshade and horsenettle are frequently hosts of Septoria leaf spot and should be eradicated around the garden site. Use crop rotation. Next year do not plant tomatoes back in the same location where diseased tomatoes grew. Wait 1–2 years before replanting tomatoes in these areas. .Organic StrategiesStrategies 1, 2, 3, 4 and 6 are strictly organic approaches. Using an appropriate organic herbicide (or removal by hand) would be viable organic approaches to Strategy 5. Yes. This looks like what my tomatoes have. Thank you! I had it on a few plants last year, at first sign, cut off infected leaves, cut lower branches off plant up to about 6-8 inches above ground for good air flow, never overhead water, only water that touches the leaves is rain.. Wash hands between touching plants. Side note, if you smoke or chew, always wash hands before you go into the garden, never toss butts or spit in garden, heirlooms are very susceptible to tobacco mosaic virus. Use good organic fungicides as needed.